As kids, my older sister and I watched Sesame Street. Our favorite scenes were any and every scene with Bert and Ernie. As we grew older, we jokingly nicknamed each other as the duo: She was Ernie and I was Bert. Well, more like assigned. My older sister was used to bossing me around, and she wanted to be the fun puppet of the pair. So I got stuck with the more uptight character. In case you’re not familiar with Sesame Street, Bert and Ernie have distinct personalities. Ernie is the fun-loving, carefree—and very curious—one who is still learning about the world. In short, Ernie is the one you’d invite to your 6th birthday party. Bert is the rule abiding, strict—and often frustrated—one who is constantly lecturing Ernie on the right way and wrong way to do things. Yes, Bert is the brother you have to invite to your 6th birthday party if you want Ernie to show up. Recently my older sister found her Bert and Ernie dolls (Bert, of course, needed his hair re-glued). This made me nostalgic so I looked up some Bert and Ernie videos to reminisce. What I found instead was that Bert and Ernie were nothing like their popular personalities. That’s right: Ernie is a jerk to Bert. Take this scene for example. Ernie leaves the water dripping in the bathroom and Bert asks Ernie to do something about it. Instead of turning the faucet off, Ernie covers up the noise by turning on the radio and the vacuum. By now, Ernie knows Bert well enough to know that Bert can only sleep when there’s “some peace and quiet.” And that sleep is the only thing Bert ever wants past 8PM. Ernie doesn’t want to deal with the problem so badly that he does everything he can to avoid turning off the faucet. Or, Ernie is “teaching” Bert that Bert has to fix all of Ernie’s problems, no matter the time of night. Either way, it’s a jerk move. By far the worst prank Ernie has pulled on Bert was singing and dancing in the middle of the night in their room with a bunch of sheep. Now Bert can’t sleep and he has to fix Ernie’s problem of getting the sheep back to their home. And don’t get me started on when Ernie makes Bert sit behind a lady with a ridiculously tall hat at the movie theatre, when Ernie doesn’t let Bert stand beneath his umbrella in the pouring rain and when Ernie steals Bert’s nose for a sculpture. 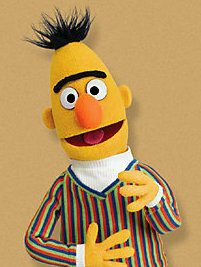 If you were Bert always dealing with Ernie’s antics, wouldn’t you be grouchy? He doesn’t get restful sleep because of Ernie’s nightly squabbles and then he wakes up to another day of cleaning up Ernie’s messes. Yeah, I’d be grouchy too. But I’m also nicknamed that. I’m not the only blogger that holds this theory. So does he. Sometimes we categorize characters incorrectly. We do this because it’s easier to remember their personality, because only select traits are emphasized over and over again, or because the writer didn’t dig deep enough to create a substantial personality underneath the superficial surface. If you’re worried that you are this writer, there’s a test you can do to verify if your character’s personality is fully developed. Then, make a case for this opposite theory. You may have to dig deep to find evidence to support your claim, but you should be able to find what you’re looking for if your character’s personality is fully formed. Because the truth is that fun-loving characters have a little jerkiness in them, grouchy characters have a reason behind their foul moods and most characters we want to read about aren’t 100% one personality trait 100% of the time. That’s why we love Bert and Ernie so much. Their personalities go much deeper than what’s said or performed. And we still love them not in spite of these traits but because of these traits. 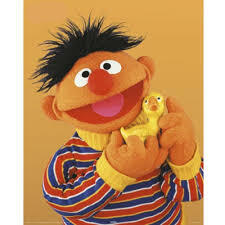 Do you think Ernie is a jerk? Share your opinions below. Hahaha I was a huge SS fan as a kid and I’ve recently been showing my 15 month old some clips on Youtube. He loves them! It got me thinking what I never noticed as a kid-Ernie is a passive aggressive jerk and I have no idea why Bert puts up with him. He doesn’t contribute anything but mess and disturbance! Does Ernie have something on Bert? He witnessed him committing a crime or something? Right? I always thought I was alone in this contrary opinion, but fortunately—or unfortunately?—many Sesame Street fans are searching the Internet to see if others like us think Ernie is a jerk to Bert.